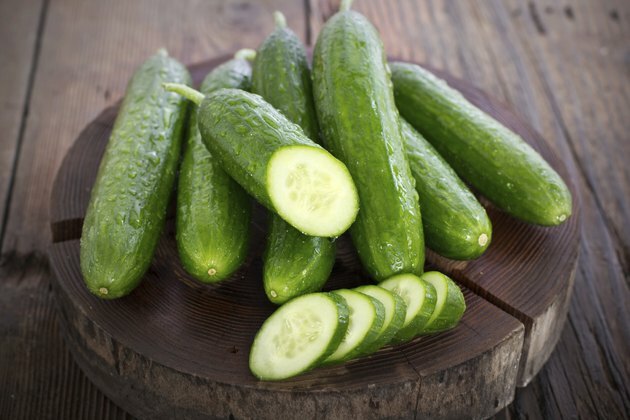 Cucumbers are cooked in a variety of ways, but grilling isn't among the most common methods. Much of this relates to the structure of cucumbers. These vegetables are high in water content, which doesn't suit them well for grilling. One of the risks on a grill is that the cucumber's water will evaporate, causing the vegetable to shrivel and dry out quickly. Although you need to take care of the cucumber and watch it closely on a grill, you can still cook it and achieve a nice effect. Cut the cucumbers across its length and into thirds. Then cut along the length of the cucumber to produce four spears per third of the cucumber. Turn the grill to medium heat. Place the cucumbers on the grill with one of the cut sides touching the grate. Grill for 2 to 3 minutes. Flip to the other cut side and grill for 2 to 3 more minutes. Remove the cucumbers from the grill. Watch the cucumbers. If they appear to be charring or shriveling quickly, remove them from the heat.